Let me start by saying that these awards were a delightful surprise during a stressful time, and I really appreciated the double excuse to smile – so thanks again to both of these kind souls! I am a Diana Gabaldon junkie. I love to travel and am a little obsessive about planning our trips! I’m a Virgo, but a selective fusspot – some things I don’t worry much about at all! My first international travel was to Scotland when I was 10 – on an 80-seat propeller plane across the Atlantic! My mother named me for her mother – then found out that the given name my Nana used wasn’t her real name! Here are the people I’ve selected to receive the Versatile Blogger Award (image above). When selecting these blogs, I tried to pick some who are actually versatile – interested and interesting in more than one subject or discipline. I do recognize that not everyone wants to go through the acceptance process for these types of awards – I certainly won’t be offended if that’s the case! However, I hope others reading this will visit these blogs and enjoy them! As soon as I post this, I will send the individual award notices, and it will be my pleasure. One great thing about the blogging community is that rather than competing, we support one another with visits, likes, comments, follows, and awards that we then pay forward to others. What could be better? June 15, 2012 Update: Holistic Complications, in a lovely acceptance blog, has included me as one of her Versatile Blogger nominees! I really appreciate this support and encouragement. Visit that post to introduce yourself to another diverse and interesting group of bloggers! 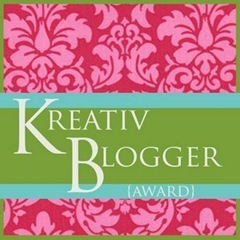 June 20, 2012 Update: GingerbreadCafe has also nominated me for the Versatile Blogger award. I’m delighted that her site has also won the award – it’s another that I have regularly visited and enjoyed! Use the link in this paragraph to see who else was nominated in that post! June 25, 2012 Update: Campanulla Della Anna has listed The Retiring Sort as one of her nominees for the Versatile Blogger award. She has also listed a nice variety of other bloggers. Use the link in this paragraph to see who they are, and visit them! This entry was posted in Blogging and tagged Blog, Blogger, blogging, Blogging Awards, Diana Gabaldon, Gratitude, Kreativ Blogger Award, Thanks, Versatile Blogger Award. Bookmark the permalink. Thank you- and thanks for taking time to visit! Thank you so much for the nomination! I appreciate it greatly! Many many thanks for such a wonderful award. I promise I will respond. It may not be soon but I will get there! Thank you again.! My grandmother loved the fact that she was taller than me. She would work it into a conversation almost every time I saw her. I’m 5′ 8″ and she was 5′ 11″. I haven’t read Diana Gabaldon yet but always meant to. I take it from you that she is worth it. Congrats on the award and thanks so much for nominating me. You need to read the Gabaldon books in order – if you start them, start with Outlander. Just be prepared – the time travel and romance are wonderful, and she has a fabulous sense of humor, but she doesn’t pull any punches on the brutality of the times (the English and the Scots, in the eighteenth century were, you know, at odds). Anyway, the first book is the toughest that way – so if you like that one overall, you’ll be hooked! Thank you for the nomination! I look forward to following the links to the other blogs you nominated and meeting other bloggers. Many congratulations on your two award nominations, both of which are richly deserved. You have a wonderful blog here that I always enjoy. 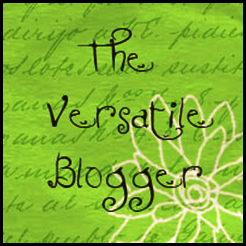 And I am delighted to accept your nomination for the Versatile Blogger Award. Thank you so very much! Congratulations! Your riches are justly deserved and your blog is such a joy to visit. And thank you so much for including me in your list of nominations. So by the way I was thinking if these awards required to be passed on to only 3 bloggers at a time more may want to accept? As a newbie I yet do not know all the bloggers which made it hard for me to accept the awards from Roly. Nice blog and nice acceptance speech! Thanks! 😉 I don’t know why you couldn’t send a few nominations at a time over time – 15 is a lot! However, I have noticed across the blogosphere that a number of people have nominated fewer than requested, for exactly the reason you give – they just don’t have that many contacts yet! Do you subscribe to the Daily Post at WordPress.com? Just a suggestion, if you haven’t tried it! I think you well earned both awards. If there was an award for world traveller always eager to experience new countries, cultures; you should be nominated for that too. I love looking at the photos on your blog of faraway places and reading your reflections on the trips. I’m surprised and delighted and want to thank you for the nomination. Thank you! Yours is one of the challenge posts I really look forward to every week. I hope you’ll meet some new friends through this! I enjoy those blogs you listed. I completed the process and listed some really versatile, interesting blogs. Thank you again so much for the nomination. CONGRATULATIONS! You really deserve these awards. I find your blog wonderful. Seriously, you’re an inspiration – I just love the way you’ve rallied the troops with your Travel Themes. Talk about a sense of community – your site has become like our little town square! Thanks for that, and for always encouraging your constituents!! !